We speak to Clare Richmond, director of SpeakTo and founder of the Crouch End Project, about what it means to apply a grassroots approach to your work, how to go about it and why it’s important to build strong foundations. Clare, what do you mean by a grassroots attitude and what value does it offer charities? Often when people hear the word grassroots they think of political movements or humble ad hoc community events. But for me the phrase grassroots is profound and means ‘the foundations’ of an organisation, business or community. A grassroots attitude (GRA) is the way in which we learn about, and motivate, the people and resources that we already have in order to achieve far more with less. So, grassroots refer to your foundations from which everything else will build. The focus is on making the most of your foundations to build stronger networks, innovation and sustainable growth. Creating a spirit of possibility together. The value it offers charities is in finding new ways to make the most of the resources you already have, finding a way to achieve more with less. Both big and small charities can benefit from adopting a grassroots approach. Simply by learning more about where hidden potential and underlying challenges lie, and how to motivate people more effectively, will be hugely beneficial. GRA is about making the most of what you already have, to become increasingly productive and sustainable. What would you say to organisations which are put off by the term grassroots? See beyond the term to what it can achieve. 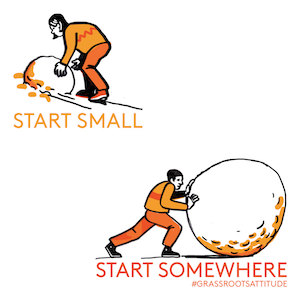 The magic of adopting a grassroots attitude is that it starts small, and grows organically. With very little a lot can be achieved, and the focus is on building capacity within the organisation, slowly but surely, so there can be learning and insights along the way. In many ways this is about making sure the investment you have made in people and resources is put to the best possible use, through better understanding, and creating an environment for proper engagement and innovation. I have been hugely impressed by what people are capable of when properly motivated and engaged. When I explain GRA to people they become intrigued by the idea that you can achieve far more with very little. It begins to appeal when I say: “It doesn’t take a lot to make a massive difference; it just takes something different to be done”. There are a growing number of examples (including the Crouch End Project) where people have achieved great things from very small beginnings, with virtually no funding or resource, or where leaders have transformed organisations with a new bottom-up approach. We can learn a lot from some of my grassroot heroes whose approach becomes a very tempting model to understand in the present day climate. There’s a growing interest in this approach, as leaders realise we can no longer afford to miss out on the potential that lies hidden around us. Ever since the financial meltdown, I think there’s been a growing realisation that the way we operate isn’t very productive. We fail to engage people properly and invest too much in trying to achieve predetermined outcomes that often bear little relationship to reality, and are frequently untenable. We have an environment where people are afraid to speak up and offer their honest views, and in a complex world this has to change if we are to make progress. We are missing out on a lot. At the root of it all is that to achieve more, to survive, we must use our resources and engage people better. The good news is that people are actually motivated by small human actions and that to progress we don’t need huge unwieldy expensive projects, but purposeful small actions that can create energy and insights that lead to real innovation and growth. How can charities adopt a grassroots attitude? What are the key points to consider? Grassroots leaders have to work with what they have – they don’t have the ‘luxury’ of choosing who they work with, or even when, so they have become experts at engaging and motivating all sorts of people. Even the most unlikely people with no experience or qualifications have risen to achieve far more than even they might have anticipated. Invest in understanding the full range of exciting capacity within your teams and communities. Discover where your underlying challenges and opportunities really exist. Frequently we find surprising things when we begin to ask questions, and take time to understand. Often ideas and solutions come from the most unexpected places and people. There are all sorts of things happening under the surface that are worth bringing to the fore in a carefully facilitated environment. Start people talking, ask them for ideas, and begin new dialogues and debates. Whatever the size of your organisation, there are people who will have important insights, ideas and concerns to offer but their voices aren’t being heard – you need to find a way to get them heard. Spend time getting to know the people you work with. I would be very surprised if you don’t find out something of real value. Grassroots leaders have to work with what they’ve got, but they also have a certain freedom to be agile and responsive in the way they operate. This means they have learned how to embrace uncertainty and accept human fallibility, so their rewards have been rich. Create a connecting purpose that everyone understands and can contribute to. It doesn’t need to be a grand corporate, put-it-in-a-picture-frame style text, but something internal that connects and ignites a spark in people. Develop a framework and narrative to support learning and innovation and that encourages greater ownership and commitment. The sad reality of life is that most of it is uncertain and, despite well laid plans, things will go wrong and mistakes will be made. This in itself isn’t a problem; the problem arises when there is the absence of a narrative and framework to properly address them. We need to learn to work with reality, not simply try to control it. Without money, resource, template or sometimes permission (instead of waiting to be asked to act people are taking matters into their own hands) grassroots leaders have to start somewhere and create something. The necessity to start small has huge benefits, allowing a level of experimentation and innovation frequently missed in more conventional organisations. Actions always speak louder than words, so small action strategies create energy and momentum whilst building real insights and learning. Small investments reap great rewards in this way. By learning from your actions you can trigger fresh thinking, create interest and promote greater understanding. Too often people engage others without considering why someone should respond. If the answer is that they ‘have to’, then be aware that ‘answers’ or ‘exchange’ may lack honesty or substance. In any eventuality engagement needs to have clear value for both parties, or have a bank of goodwill existing; it’s not enough that it’s just important for you. Otherwise, as we have often found, engagement risks being reduced to simply a box-ticking exercise, a superficial exchange of information that lends little to real understanding or discovery of opportunity. Value in this context need only be that people feel heard and there is a point to their involvement. Frequently we find people are reluctant to engage people for fear of what they might find out or hear. To them we urge you to ‘face the uglies’. We must learn to address differences, be open to confrontation and conflict, and respect other people’s views. These are where the real catalysts for change reside. Take discussions from the office out into the illumination of daylight. This also applies equally to your staff. To make good decisions about your organisation, you need information on the range of views, insights and opinions that really exist throughout. Research supports this, we need the full range of experience in our organisations to fully appreciate the opportunities and challenges. It might work in the short term but unless people have a sense of ownership and feel their voice is heard when developing a new initiative, people fall by the wayside quickly. SpeakTo works with organisations to help them to identify and understand their potential underlying challenges and opportunities, and to build strong foundations for a sustainable future. Operating for 120 years, The Peel runs community activities and projects in Clerkenwell, London. In 2018, the charity developed a new vision and purpose to bring people together and build a sense of belonging in the area. The Peel appointed SpeakTo to help them identify the steps needed to build engagement with local businesses. The agency developed a narrative for the charity outlining what the organisation should be saying to the community and why businesses should become involved with The Peel Institute. They carried out desk research identifying the different sectors which existed in the area and worked out a different narrative for each industry. Richmond and her team then spent time meeting with local businesses and finding out their views on the area, and explaining what the charity hoped to achieve. At the end of the six weeks, 15 businesses had expressed an interest in being involved in the charity’s work, with others saying to come back once they had more information. SpeakTo presented a plan of how best to communicate with these businesses, what help businesses could offer and what potential there was to develop a relationship with them. Advance Together, a political party set up by grassroots campaigner Annabel Mullin in Kensington and Chelsea, London, in the wake of the Grenfell tragedy, felt it needed to engage communities differently to mainstream politics in the UK. SpeakTo ran a workshop for the party’s candidates to help them connect with constituents. Richmond identified that the language the party was using to describe its work and purpose was a barrier to engaging the local community. Mullin says SpeakTo helped them to adapt the language they w using when speaking to the local community. “When you arrive on someone’s doorstep or hand out leaflets, there’s a compulsion to share your own views before hearing what other peoples’ values are. The language you use can often shut down a conversation rather than open it up.